Your customers can see how much their shipping will cost in real time when they get to your checkout. iZettle E-commerce connects you to all major international carriers like FedEx, DHL, and Parcelforce. Your connected carriers then return the rates and available services. During checkout, your customer will simply select the service that they would like and the selected shipping rate will be added to the order total. *If we cannot obtain real-time rates we'll use the manual rates that have been configured for that country. An account for a carrier who operates within your country. For some countries and carriers, you can use our default account to obtain retail rates from the carrier. First, you need to make sure you’ve entered your own address correctly. We need this so that we can request accurate rates from your connected carriers. In some countries, we'll also validate your address with the carriers to ensure it is correct. 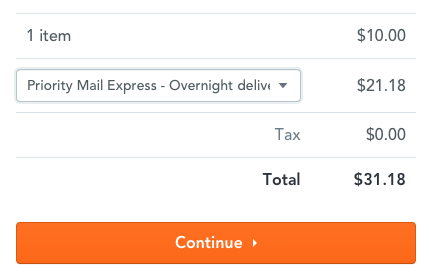 As part of real-time rate calculation, we need to send the default parcel size to the carrier so that they can calculate the appropriate rate. Most carriers use a dimensional weight which is determined by the carrier based on the height, width, and depth of your packages. If the dimensional weight for the order is larger than the order's weight, your customer will be charged for the dimensional weight of their order. Dimensional weight calculations vary between carriers. To get real-time shipping rates at the checkout, you need to connect to a shipping carrier. Options vary by country. Find your shipping settings on the E-commerce dashboard by navigating to > Settings > Shipping > Real-time carriers. Default account - Uses the iZettle default account to calculate retail rates from carriers. Own account - Uses the provided account details to calculate account rates from carriers. For some carriers, we can calculate rates using our default accounts. These accounts will return retail rates i.e. The rate you would pay in the shop. If this option is enabled we'll contact the carrier to return retail rates during the checkout process. To use your own rates you'll first need to create an account with a carrier that operates within your country. Once your carrier account is approved you'll need to connect the carrier account within iZettle. Once you have entered the required information, click 'Save'. If the option to connect your own carrier account is available you can enter your account details to get the rates you have negotiated with the carrier. The information required varies by carrier. On the shipping settings page, you need to configure how rates are calculated for each country that you ship to. Real-time & manual rates: We'll contact your connected shipping carriers to obtain rates. If rates are not available from the carriers we'll use the manual rates that have been configured for that country. Manual rates: We'll use your manual rates for all orders shipping to this country. Read more about Manual rates here. During checkout, we'll contact your connected carriers for real-time rates and display these at the checkout. If multiple carriers have been connected we'll display rates from each carrier. If we cannot contact the carriers for real-time rates and you have selected 'Real-time & manual rates' for the country, then we'll use your manual rates to calculate shipping for the order. Depending on your location, you might be able to sync with additional carriers by connecting to Unifaun or Shippo.